Over the last 2 years it has been a pleasure of mine to offer the design community free PSD Mockup templates for testing product designs. In general, the site, and the Actions both seem to be appreciated so I’ll keep plugging away at creating more Actions as time goes on. However, in those 2 years I have seen a pattern of errors surface in the usage of the Actions that I would like to tell you about so that you may avoid these errors yourself. Designs which look like they are improperly applied to the resulting product are typically due to the use of smart object vector graphics. If your smart object vector graphic is larger than, or scaled beyond, the borders of the template created with STEP 1 then the resulting render from STEP 2 will look incorrect. The design dimensions which STEP 2 expects will be much larger and therefore the transformations which are applied in STEP 2 will be applied to a design which is much larger than what was expected. The solution is to rasterize your smart object layers so that they are successfully cropped and transformed. The most annoying attribute to creating Actions is that they record the name of the layer when selected rather than the ID of the selected layer. The error that users of non-English Photoshop license will see most often is that the Action cannot find layer “Layer 1” or layer “Background”, notice that those two errors are due to English words that the Action has recored. This problem causes the Actions to fail in any language that is not English — I’m extremely sorry about this. Anyone who is not using the English version of Photoshop can download a JAVA utility to search and replace these two english words for the corresponding words of their language. Download the app here. This one is the least encountered but I still get polite complaints about a blank canvas. There was an incremental update to Photoshop CS6 after its initial release, the version number was 13.0.2 and had a fairly obscure memory leak when working with documents with extreme resolutions. Most of the Actions on this site use extreme resolutions. The result of rendering a mockup with release 13.0.2 is that the canvas would be a solid white document. All the layers are correctly created and clearly visible but Photoshop is simply incapable of allocating the proper resources to update the canvas therefore leaving it solid white. The solution is to update to 13.0.3 or higher. Let’s first address what the term user inflicted error actually means — and please keep in mind this definition comes through my own observation and is not meant to offend anyone: User Inflicted Errors are caused when both new or seasoned Photoshop users make basic workflow assumptions that I cannot account for (Actions must be used in a very specific way). Not following the recommended usage procedure can lead to errors like “The command ‘copy’ is not currently available”, improper texture application or outright failure to complete the render. Each Action comes as a 2-part process. Running STEP 1 creates your PSD Mockup template onto which you will drag and drop all your assets you need rendered onto the final product. Some users are modifying the Layer names, order or visibility of the template layers. The template can sometimes be specific and STEP 2 will fail if these expectations are missing. For example, running STEP 2 will immediately merge all visible layers (a very different process from flatten), if layers are hidden then they will not be merged which leaves the entire Layer stack in an unexpected state. Your render is now guaranteed to fail because STEP 2 is expecting a specific number of layers which is no-longer the case due to the hidden layers which were not merged. More advanced users will know how to safely delete template layers if their designs make use of transparency, but in general the safer bet is to simply place your designs above all the template layers (which covers the template data) and then run STEP 2. Please be mindful that the Actions which are downloaded from this site must first be unzipped prior to being installed. There is a tutorial on this site on how to install and use the Actions properly. I often use the term PSD Mock-ups on this site which can lead to some confusion. 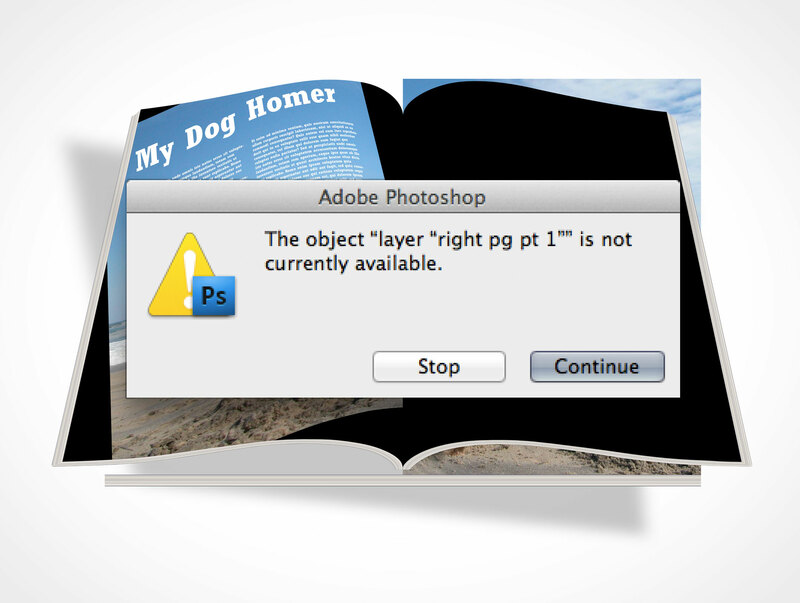 Some users complain that they cannot find the PSD Mockup template after they decompress the downloaded archive. What these users don’t realize is that the Action script itself is responsible for creating the PSD Mockup templates. The tutorial on this site makes it clear that running STEP 1 within any PSDCovers Action is what generates the PSD Mockup templates. A great deal of effort goes into making the Actions as broadly compatible with Photoshop CS4 and higher. All the Actions on this site are created in Photoshop CS4 and tested in CS5, CS6 and CC7. There is a surprisingly large number of users of Photoshop 7, CS, CS2, CS3 and Photoshop Elements who attempt to install and use the Actions on this site. Please note that the Actions on this site are only intended for CS4 and higher.